The Hourglass Nebula, also known as the Engraved Hourglass Nebula or MyCn18, is a young planetary nebula in Musca constellation. The nebula lies at a distance of 8,000 light years from Earth. 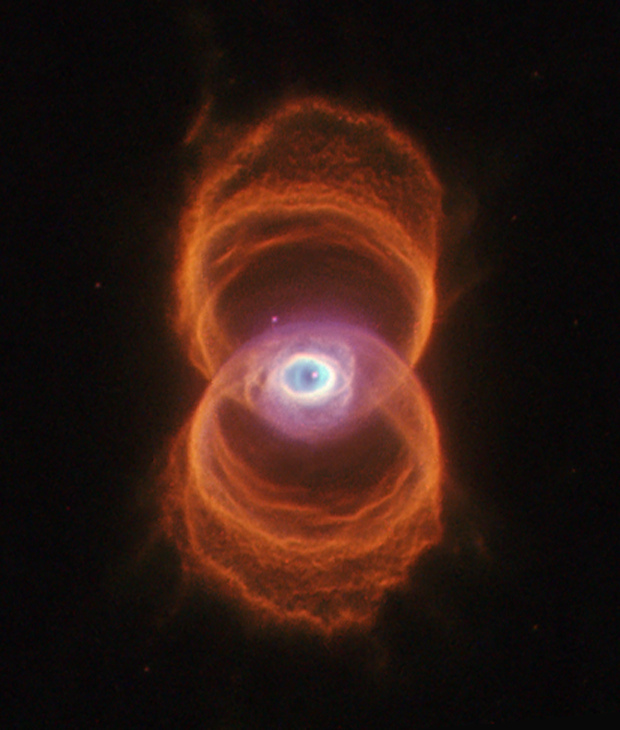 Its unusual appearance, with two large outer rings and a small central one, has earned the nebula the nickname the Eye of God, one that it shares with the better known Helix Nebula in Aquarius. Some of the striking features of the Hourglass Nebula remain a mystery to astronomers, including the offsetting of the progenitor star from the nebula’s centre and the formation of the nebula’s inner rings. The Hourglass Nebula (MyCn18) is a young planetary nebula located about 8,000 light years away. This artificially colorized image was taken with the Wide Field and Planetary Camera 2 aboard NASA’s Hubble Space Telescope. The image reveals the true shape of MyCn18 to be an hourglass with an intricate pattern of ‘etchings’ in its walls. This picture has been composed from three separate images taken in the light of ionized nitrogen (represented by red), hydrogen (green), and doubly-ionized oxygen (blue). The results are of great interest because they shed new light on the poorly understood ejection of stellar matter which accompanies the slow death of Sun-like stars. In previous ground-based images, MyCn18 appears to be a pair of large outer rings with a smaller central one, but the fine details cannot be seen. Image: NASA, R. Sahai, J. Trauger (JPL), and The WFPC2 Science Team, 16 January 1996. It is the top part of the nebula that is tilted toward Earth. The shape of the Hourglass Nebula’s inner ‘eye’ is not fully understood, but the hourglass shape is believed to be the result of the expansion of a fast stellar wind within the nebula’s expanding cloud, which is denser at the equator than at the poles. The structure of the nebula may be explained by the presence of an unseen companion star and the star’s gravitational effect. Ring 1 could have been formed if the central star had been close to the theorized companion and if the mass transfer to the companion’s surface had caused an explosion resulting in an expanding shell of material forming the ring. The bright elliptical ring in the centre of the Hourglass Nebula appears as an equatorially dense region at first sight, but is really a potato-shaped structure with a significantly different symmetry axis from that of the larger nebula. Like other planetary nebulae, MyCn18 was formed when a star with a mass up to eight times that of the Sun ran out of fuel near the end of its life cycle, evolved into a red giant, and expelled its outer shells, starting to lose mass. The central star’s hot inner core, collapsing from a red giant to become a white dwarf, started to radiate intensely, with the ultraviolet radiation causing the expanding shell of gas to glow. The Hourglass Nebula will slowly disperse into space over the next few thousand years, with the central white dwarf cooling and fading away for billions of years. This will be the fate our Sun in about 5 billion years. The central white dwarf that illuminates the nebula lies off centre, which is unusual for a planetary nebula, because progenitor stars are expected to lie at the centre of symmetry. The anomaly may be explained by the presence of a companion, which would make the central star part of a binary system. The Engraved Hourglass Nebula is not to be confused with the less famous Hourglass Nebula located inside the Lagoon Nebula (Messier 8) in Sagittarius constellation, nor with the Hourglass Nebula in Cygnus. 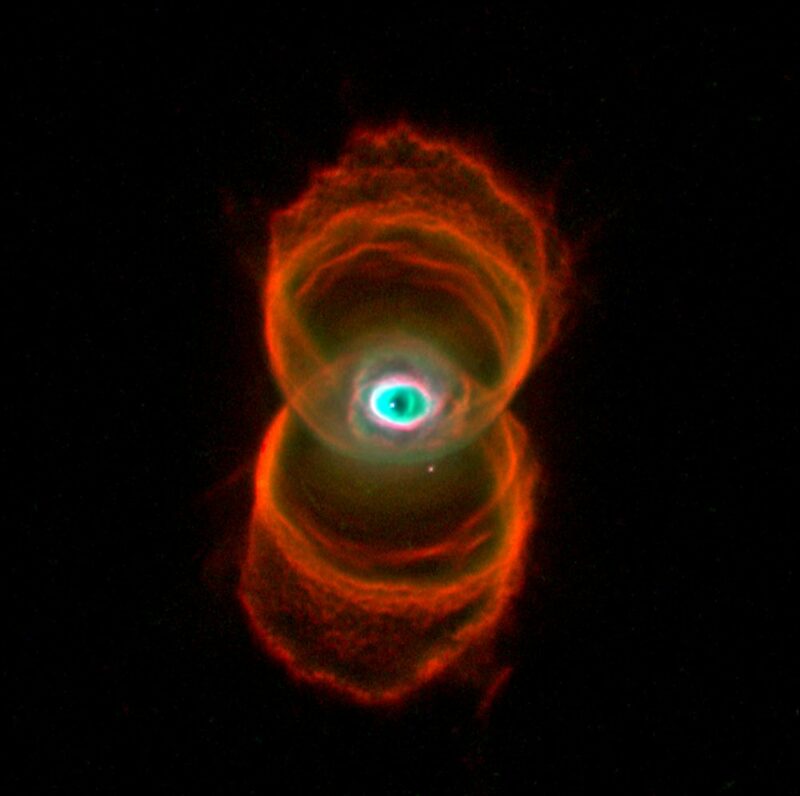 Pop culture references to the Hourglass Nebula include the game Final Doom, Pearl Jam’s album Binaural (2000), the animated series Space Pirate Captain Herlock: The Endless Odyssey, the film Angels & Demons (2009), and the video games Mass Effect 2 and Mass Effect 3. The Hourglass Nebula was discovered by Annie Jump Cannon and Margaret W. Mayall between 1918 and 1924, during their work on an extended Henry Draper Catalogue, an astronomical star catalogue providing spectroscopic classifications for hundreds of thousands of stars. At the time, the object was noted simply as a small faint planetary nebula because its shape was not discovered until much later, when advanced imaging techniques and improved telescopes became available. The nebula’s hourglass shape was discovered on January 18, 1996 by Raghvendra Sahai and John Trauger of the Jet Propulsion Laboratory at the California Institute of Technology in Pasadena. The central star of the Hourglass Nebula is a hot Wolf-Rayet (WR) star, with a temperature of about 110,000 K. The star has ejected its material and is now responsible for the nebula’s glow. MyCn18 is approaching us at an approximate velocity of 67.8 kilometres per second. The Hourglass Nebula expands at 10 kilometres per second. The nebula lies 1.5 degrees to the south-south-east of NGC 5189, the famous Spiral Planetary Nebula, also located in Musca constellation.